Peter H. Marsalis and Mary Magdalene (Polly) Gordon arrived in what is now Mississippi about 1810, purchased land, and raised their family. 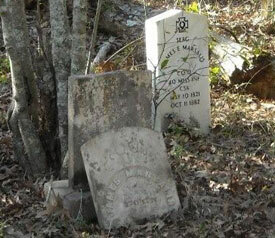 When Peter died he was buried on his land, as were other relatives, and was the beginning of what is now called the Marsalis Cemetery, which is located near Liberty, Mississippi. It is our belief that all Gordon’s, who continue to live in the area, and all Marsalis’ living in the south can trace their roots back to either Mary Magdalene Gordon or Peter H. Marsalis. On one of our visits (15 years ago) to the cemetery many of the grave sites, including Peter and Mary’s were in a fair state of repair. A recent visit (Nov. 2008) stunned us when we viewed the site. Trees and briars have taken over, five to eight inches of forest debris now covers the grounds, headstones have been broken, Peter and Mary’s tombs are barely discernible, and many of the headstones cannot be seen. Our project is to restore the cemetery by cleaning the grounds, possibly restoring the tombs, fencing the area, and placing a sign denoting the cemetery. In February, Bill and I will be attending a meeting of the Amite County Historical Society in Liberty, Mississippi and during that time get estimates regarding cleaning, fencing, and restoration. The present landowner is happy to know that someone is willing to restore and care for the cemetery. If any of you have pictures of the cemetery showing the graves, a copy would be greatly appreciated. This would help in locating graves that are no longer visible and assist in the restoration. If you wish a copy of the proposed book, or would like to contribute to the project, please contact us. The Marsalis Cemetery is located near Liberty, Mississippi in Amite County.